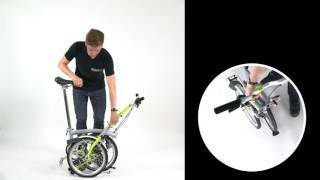 The Brompton H3L 2017 Folding Bike, features Brompton's H type handlebar, the H Type is for the rider that likes to sit in a more upright riding position. A 3 Speed BSR Hub, the Brompton Standard Range hub is an updated version of the original Sturmey Archer hub used on their very first bikes; Brompton's are as simple and user friendly as they come, using their patented folding mechanism, no folding bike can fold as fast and as compact as a Brompton can. The H3L comes equipped with Brompton mudguards, giving you the opportunity to ride to work in most conditions without having to worry about a change of clothes.